Hi everyone. This past weekend we had a great drink and draw at SC COMICCON! We raised almost $1500 bucks for Team Cul de Sac! Thanks to Rob Young and everyone at the show! We had a blast! Now to look forward to June. This will be our 6th annual Drink and Draw at Heroescon. It happens of on the evening June 17th. I will have the exact time and place for you soon! Here is what we need to make the big bucks. Art from you! Yes, we will be at the show at a booth. Yes, we will have artist who can sit with me and can draw on the spot! Yes, you can drop off the art at the show if you are attending the show. Yes, we accept original comic book or strip art. Yes, we take signed or limited edition books. Yes, we love to have amazing original art made for the event. Yes, we will take cash donations at the event. Yes, we will have signed Richard Thompson books. Yes, we have a few items left signed by Bill Watterson. Yes you can send us more than one item. 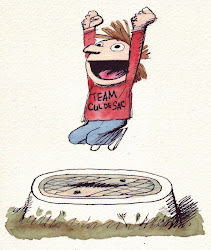 Yes, our email is teamculdesac@gmail.com and I will send you information to where to send the art. I need the art by the 10th of June. Yes, we will kick Parkisnson's, with your help. No, you can't donate too much awesome art.